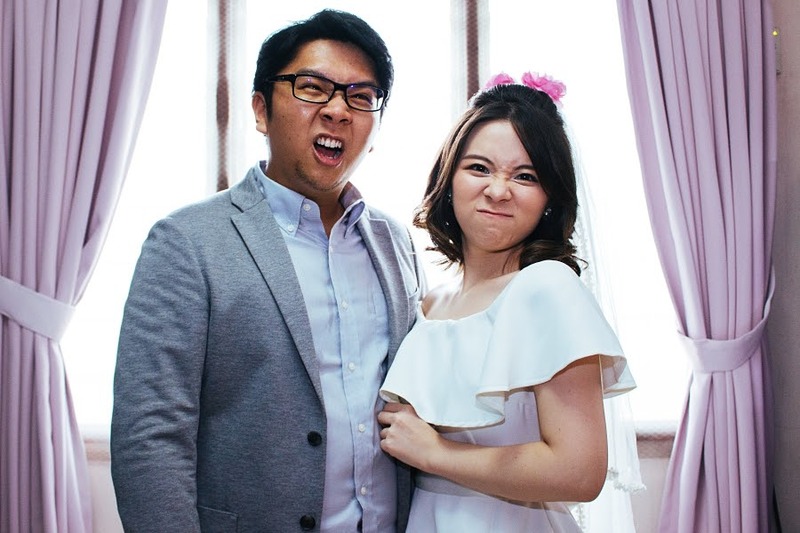 My now wife and I got hitched a couple of weeks ago and looking back, it has been a breeze compared to all the scary stories that we were bombarded with the moment people heard that we were planning our wedding. “Have you searched for wedding venues? 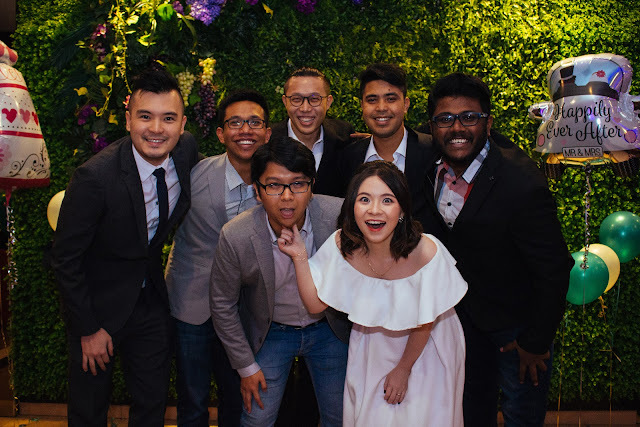 You need to book at least a year in advance leh”, “What are you wearing?”, “Are your parents agreeable?”, “Wah, so young get married already ah”, “Got money to get married or not?”, and the best question of them all, “Am I invited ah?”. Goodness me! But one thing that I am thankful for is my gorgeous wife. Through it all, she has remained supportive and an absolute gem when it came down to decision making. She always had my back and I am thankful to God for that. Now for the kickass story! It all started when we first dated. It was a straightforward, no beating round the bush kinda relationship. I asked her out on a date and she said yes. BOOM! None can resist this amazing body. I'm just kidding, it was my awesome personality that nailed it. In one of our casual chats whilst dating, we were set in mind and heart that we would have a simple, no frills wedding. One that was small and cozy. Fast forward; friendly hug – attraction – proposal to be boyfriend and girlfriend – held hands – first kiss – first fight – first video together – got down on one knee and she said yes. HAPPILY EVER AFTER! Or at least in every other Disney movie. But then here came the wave of “WEDDING PLANNING”. 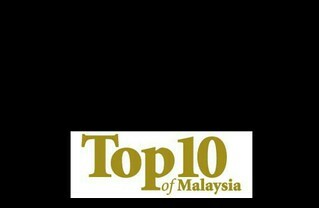 Here came the unwelcomed suggestions and ideas of what is best and how things should be done. Here came the cultural needs and practices that needed to be adhered to. Here came the “You are too young to get married la”, “Got money or not?”, “What’s the rush?”, “Have you found a venue for the wedding yet? Need to book in advance leh!”. The unrealistic projections of how much a wedding would and should cost was absolutely out of this world. 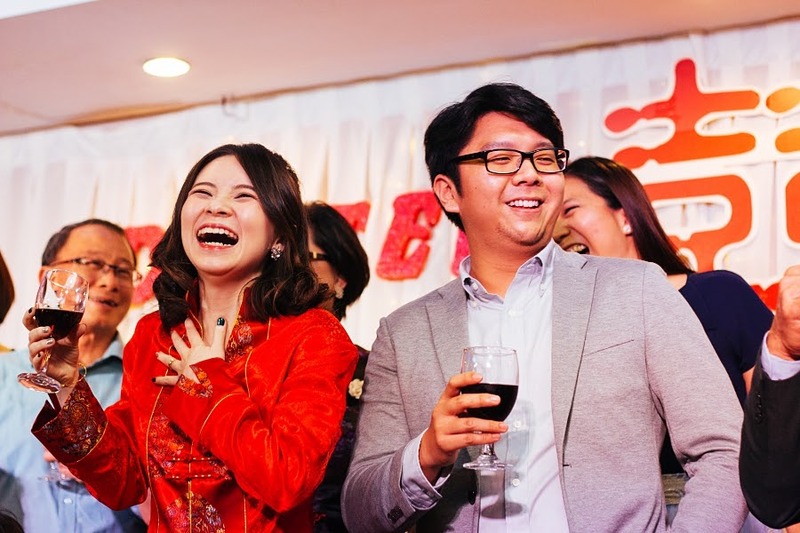 Being Asian, the pressure of having an extravagant wedding is not a luxury, it is a necessity. However, a wise man once told me to NOT spend on the wedding but spend on the marriage. I plan to stick to that wise advice. Keeping focused, my then fiancée and I shrugged off all comments and decided to take on the wedding planning ourselves. Our parents were the coolest people by allowing us to take control and decide on how our wedding should be like. The most important thing to us is having the blessing of our parents to have a small wedding. Minor details aside, we decided to have our wedding at home. The idea of getting married in a cozy place with only the people closest to us made so much sense and it got us all excited because we only had to manage a small space. I kinda had an idea of how it would look like but when we were done with it, it was beyond everything I’ve imagined! We took out our old lights from last Christmas and that became the wonderful backlight. 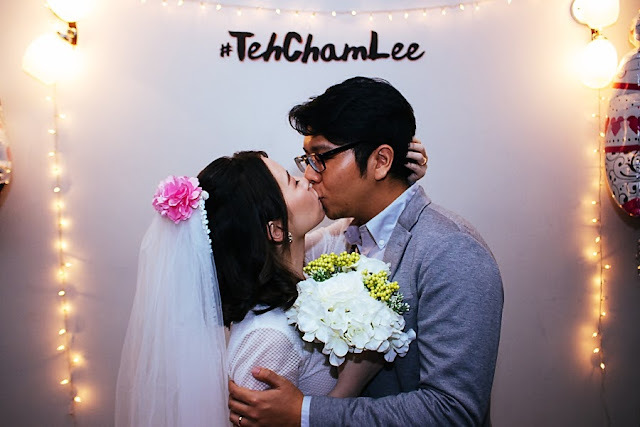 My mum asked for our #TehChamLee logo from the videos that we do and she got it printed. She even took time to cut out the words from paper! And that became the focal point of every photo taken during the wedding. Great call mum! It was simple and very pretty. My cousin, Jenny, owns a party equipment shop and she sponsored all the balloons you see in this photo. We did not ask for it but she wanted to contribute something to the wedding and the balloons made so much difference to the look and feel of the wedding. Thank you so much Jenny! My wife, Jian, found herself a simple white dress from an independent store for less than RM200. She looked super gorgeous in it! And I got myself a Silver shirt and a grey Coat from Uniqlo for less than RM300. I wore my previously owned skinny jeans because it went well with the shirt and coat. But mostly, we were going for the maximum level of comfort. You can see it from our elated faces. We even did the wedding car decorations ourselves! Jian got the materials and we did it together! It was really fun for us as we had the chance to spend some time together a day before the wedding. Then came the most important part, the guest list. We decided that the idea of a small wedding is to only have the people most important to us to be there. We wanted to have the pleasure of interacting with everyone who was at the ceremony. Goes without saying, it was our immediate families and our closest friends. The wedding ceremony was everything I had dreamed of and more. Not that I have thought much about it but looking back, I wouldn’t change a thing. 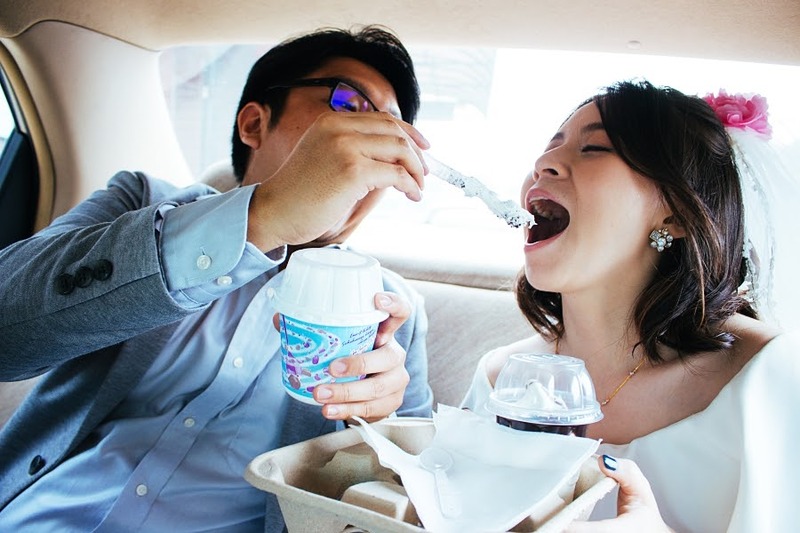 The chilled environment, the laughter, the not so solemn ceremony, the Ice-cream stop on the way to the ceremony, to getting married to the most beautiful girl in the world. I am blessed beyond words. For the rest of you out there who are considering marriage, I won’t tell you how to do it but if you are considering a no-frills wedding, by all means go for it and don’t turn back! It’s real cozy and it will damn sure save you a couple bucks for the honeymoon or that overpriced house loan. Congrats to both of you. A nice and simple wedding but as long as both of you had enjoyed. I think that the most important thing is that you guys have fun together! I think the best part about a wedding happiness if the couple. 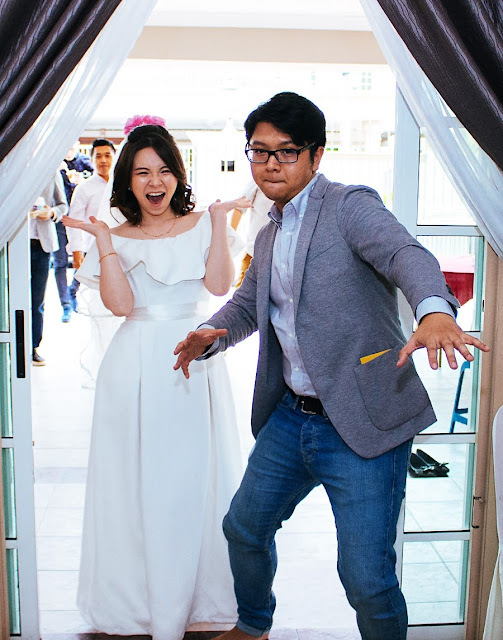 Your pictures reminded me of goofy friend of mine who recently got married in one of the Seattle venues. 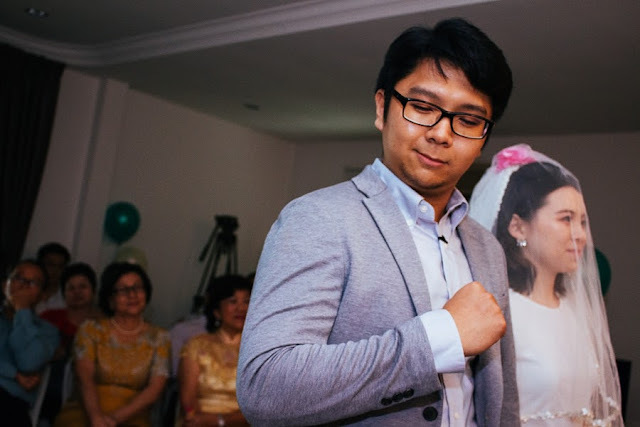 Their wedding album is truly a treat!